Unless you consider TMZ a reliable and fair sports source, Jerry Jones has done his best to subdue his knack for attention-grabbing hyperbole this preseason. No "Glory Hole". No "beat the Giants' asses." A little change of address here and a historic re-naming there. But nothing for froth-mouthed critics to latch onto. Same for this morning, when Jerry re-booted his weekly radio show on - CLUE #2: "saw" - 105.3 The Fan. Jerry avoided terms like "Super Bowl" and "playoffs" and instead settled on dropping the C-bomb. "The bottom line is we can compete," he told R.J. Choppy and Shan Shariff. "We've competed with a lot of the players that we have right now. Over the last two years, a lot of people would say, 'I don't call 8-8 competing', and they'd be justified in saying that." The Cowboys, of course, lost NFC East Championship Games in Week 17 finales the last two seasons. "We were real close to getting down there at the end of the year," Jones continued. "We were very close to getting in the tournament and doing some good things. Now 'maybe' and 'close' and 'hopes', all those things, they're hard to chew after you sit back and look back on it after the season's over. That's what we're trying to reverse." In the recent past, Jerry has lamented that "I don't have time to have a bad time." But at this point he seems content on, gulp, merely competing. And those Super Bowls seem farther away than ever. Any other GM in the league would have been fired three times over by now. Even he's now lowered his expectations to those of the rest of us where merely competing is what we can hope for and deep runs in the playoffs and contending for a title are a mere distant memory. As an aside, anyone know where I can get those old VHS tapes from the early '90s seasons of the Cowboys converted to DVD? I'd like to show my kids what it was like to have something better than a mediocre-at-best football team in our area. Can't disagree. Even Jerry admits that Jerry the owner would have fired Jerry the GM. 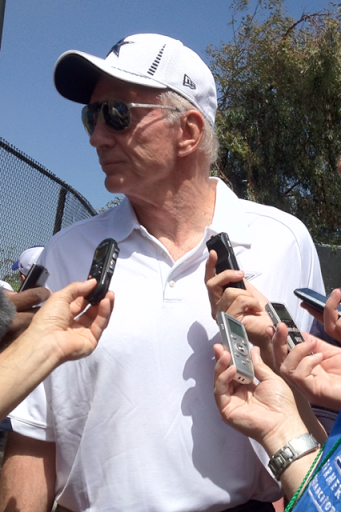 Could this be Garrett rubbing off on Jerry like he told his players to watch what they say when talking to the media? Jerry does have a tendency to say things trying to be positive and ends up having media take his comments to Garrett and ask Garrett why he and Jerry say two different things. What's an NFC East Championship Game? That's what homer Cowboy fans have made up to satisfy their playoff cravings. Yeah when is the NFC East Championship Game going to be played this year? Is that like the Big 12 Championship Game? I'm so confused. I'm not very good at this topic, so I can not say anything about it.